Freelance writer and perpetual child. Eckersley's is one of the leading art a craft supplies stores around Australia and this year, for the holiday season, it's a top school holiday's destination. 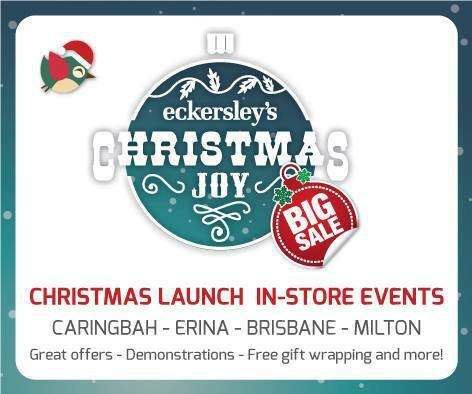 Eckersley's has held Christmas launch events at its Milton, Caringbah and Erina stores already and now its Brisbane's turn. There will be a raffle, free gift wrapping, free face painting, a children's colouring-in competition and the first 25 customers receive a free gift! The store has an excellent range of paper craft supplies at the front including a beautiful array of card stock. The art supplies can be found further into the store including the usual array of paints, pencils, canvases, etc. Last time I was in store I stocked up on fabric paint for clothes stamping, of which they have a wide selection of colours including glow in the dark! The event is this Saturday the 6th of December from 10am to 4pm at the Brisbane Store (on the corner of Edward and Mary Street). The store is open Monday to Friday 8:30am to 6pm and Saturday and Sunday from 10am to 4pm.